You are currently browsing the tag archive for the ‘The Blue Mountains’ tag. There was one additional thing I can hardly bring myself to mention: an expectancy. I sensed it, felt it hovering lightly in the air. The house was awaiting its new owners, impatient for its life’s work and purpose to begin. It was almost as if it was – repudiating me, but that is too strong. Yet I was aware that a distance had opened up between us. The intimacy of our relationship, the three-way interplay of myself, Teddy, house – it was no longer there. And more than that, it was as if it had never been. It had blown away, just like my money. Vanished without a trace, and from this day forward I could be nothing but a casual visitor. I felt I was trespassing in my own house. I am becoming wary of reading any further books featuring teachers. My dad was a teacher and I have worked with Education departments in the time, so I have a lot of empathy for the profession. Yet every book I read involving a teacher these days seems to involve child abuse of one form or another. Not comfortable reading, certainly not something I would choose to read. So it would take an extra special author to attract me to this kind of story. Luckily Virginia Duigan is just such an author. Thea is a retired school principal who has enjoyed her lonesome existence in the Blue Mountains accompanied only by her dog Teddy. Unfortunately due to a slight hiccup in her finances – and the complete loss of her savings – she has been forced to sell her dream home. The couple who buy the property, Frank and Ellice, are trendy hipster who seem inoffensive enough at first, but Thea cannot help but feel resentful as she is forced to retreat to the old hut she owns on a neighbouring plot. Then she meets the couple’s adopted child Kim. The young girl, abandoned by Frank’s absent brother, instantly bond with Teddy much to Thea’s initial annoyance. However, as time she passes she discovers a kindred spirit in the twelve-year-old, a girl who is as out of time as Thea, eagerly devouring old books and adopting the older woman’s speech patterns. During this period of upheaval in her life, Thea has also been attending a series of writing classes. Though she is fond of quirky rhymes, she feels insecure about her own literary talents. As the book progresses it becomes clear that her classes are also intended to facilitate a long-overdue catharsis, concerned with a teaching colleague from years before named Matthew. Thea still carries a massive burden of guilt related to the dishonourable end to her teaching career. This influences her growing sense of responsibility for Kim, as well as her concerns over Ellice and Frank’s parenting skills. Duigan captures Thea’s voice brilliantly, clinging to very proper phrasing and anachronistic expressions, her bitterness the preservative that keeps her out of time. In effect her slow thaw due to Kim, her comparing of Frank to the mysterious Matthew from years ago, and the increasing use of personal insights in her writing, are all signs that Thea is slowly but surely building up to a single, climactic act. 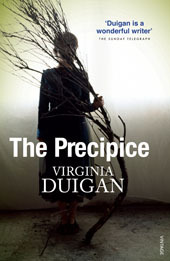 The Precipice is a strongly observed and insightful novel, from this very gifted author. With thanks to Random House for this review copy.